This week has been very productive. I’ve been contacting yarn suppliers and mills, spent a whole weekend dyeing wool, applied for a grant to do some market research and finally am near the point of having a finished product. I want to re-create the idea of the knitted/crochet doll. Normally made from scraps of yarn, under stuffed and often rather sad looking. There’s a lot of parents at the moment, choosing handmade dolls over the plastic commercial ones. I’ve also come across a growing number of mothers wanting to make their own dolls for their children. I still have my handmade Cinderella doll from when a was very young, she’s in need of a little repair here and there, but she’s lasted far longer than any of the commercial dolls I had (and I had a lot of dolls). There is something magical about having a doll specially made just for you, and something magical about a mother making the doll for her own child, whether the child is male or female. These days we are also aware of the benefits of natural materials, the benefits of supporting local people and keeping out carbon footprint as low as possible. This is where my plan gets exciting. Can I make a doll using local supplies and natural materials? 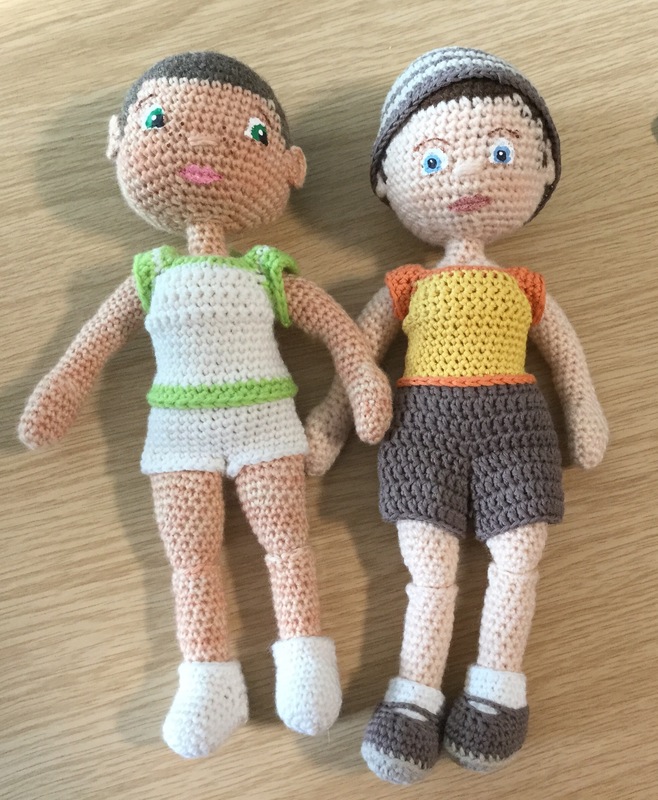 The doll on the right is made from Acrylic yarn, spun in Turkey I think, filled with polyester, clothing is made from cotton and acrylic yarns. The doll on the left is my newest doll, still waiting for some clothes to be finished. The doll is made from Bluefaced Leicester wool, from UK sheep and spun in Yorkshire. I couldn’t source any light flesh coloured pure wool, hence the weekend spent in my kitchen dyeing wool. He is filled with British Lambswool. All of his clothes are 100% wool, and even the pipe cleaners in his arms come from a small local factory in Huddersfield. But why go to all that trouble for a pure wool doll? Wool is naturally flame resistant, it’s harder to ignite than many common textile fibres. Even if you hold a flame to the wool it doesn’t melt. Not that you were planning on buying your child a lighter, but it is reassuringly safe. Wool is biodegradable, and I don’t mean it will disappear in a thousand years. If you bury the doll, he will naturally decompose in a matter of a few years, slowly releasing it’s valuable nutrients back into the earth. Wool is a renewable fibre, just sun, water, grass and good old mother nature (oh and a sheep or two) and you’ll have another fleece to make another doll. Bluefaced Leicester Wool is considered one of the finest fibres of British sheep breeds, it’s a long wool fibre which gives a soft smooth feel to the skin. Wool absorbes moisture, wicking it away from the skin and evaporating into the air, making sleeping with the dolls more comfortable and less prone to clamminess. Wool is an active fibre that reacts to body temperature, it helps you stay warm when the wether is cold and cool when the weather is hot. Because of wools moisture absorption ability is doesn’t attract static, making it less likely to attract dust and lint. Wool also has a natural protection that helps prevent stains from being absorbed. New scientific research is being done to show the health benefits of wool with amazing results, wool bedding and sleepwear appears to promote a better nights sleep, and new research is showing that wool nightwear is helping people with skin conditions such as dermatitis. A good reason for taking the doll to bed with you. Add these reasons to the fact that the materials for the doll have all been produced within a 60 mile radius, mostly from small businesses, and you can see the benefits this doll can bring.